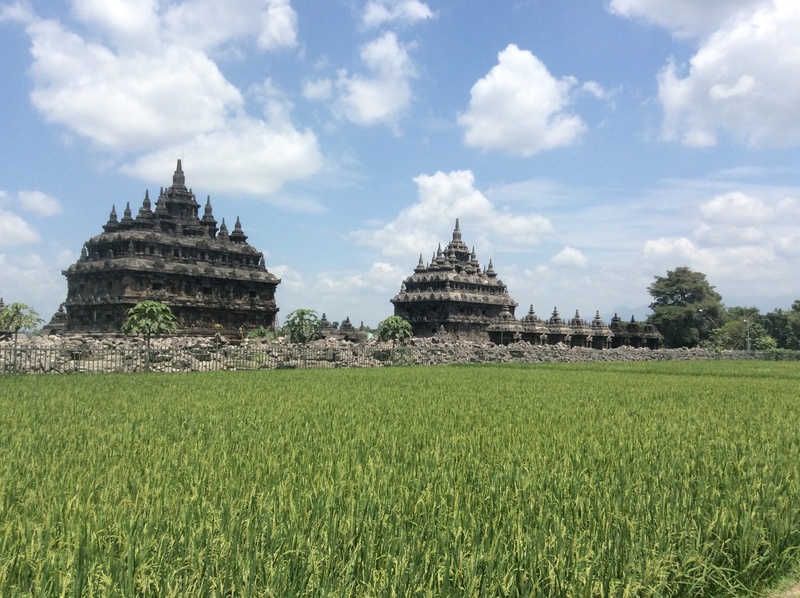 A major reason why we came to this part of Indonesia was to visit Borobudur, Prambanan, and other smaller Buddhist and Hindu temples scattered around the Kedu plain, north of Yogyakarta. Well, Mt. Kelud’s eruption put paid to that plan! 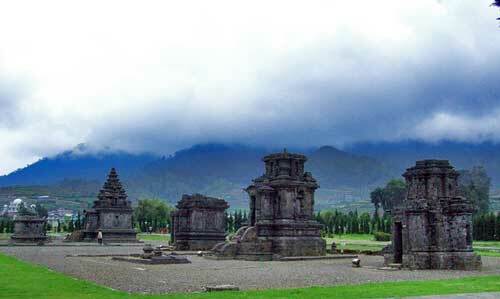 With equal indifference the volcano covered all temples, Buddhist and Hindu alike, with a layer of ash. Result: all the sites were closed to visitors while clean-up crews moved in to wash off the ash. What to do, what to do? Well, hope springs eternal, as they say. 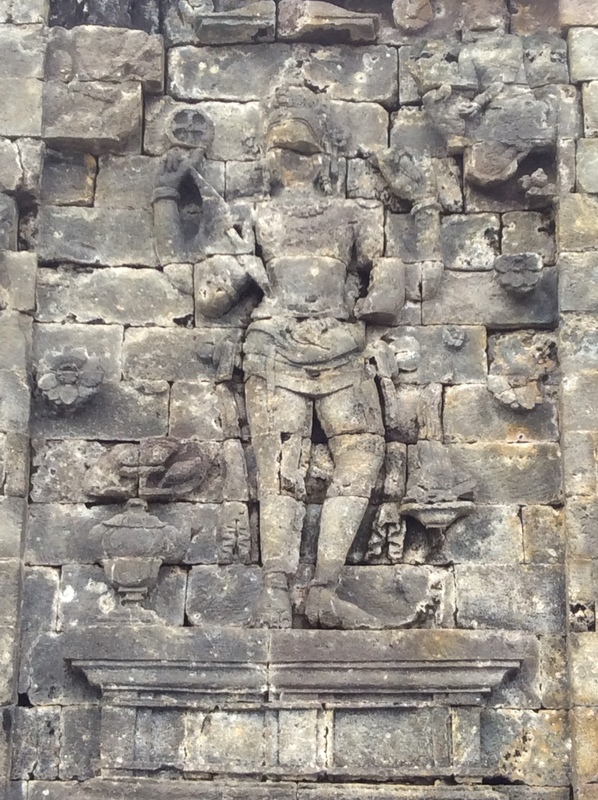 We kept telling each other that surely they would reopen the temples quickly, within a few days, maximum! I mean, all those disappointed tourists milling around! All their money not being spent on entry tickets and ancillaries! 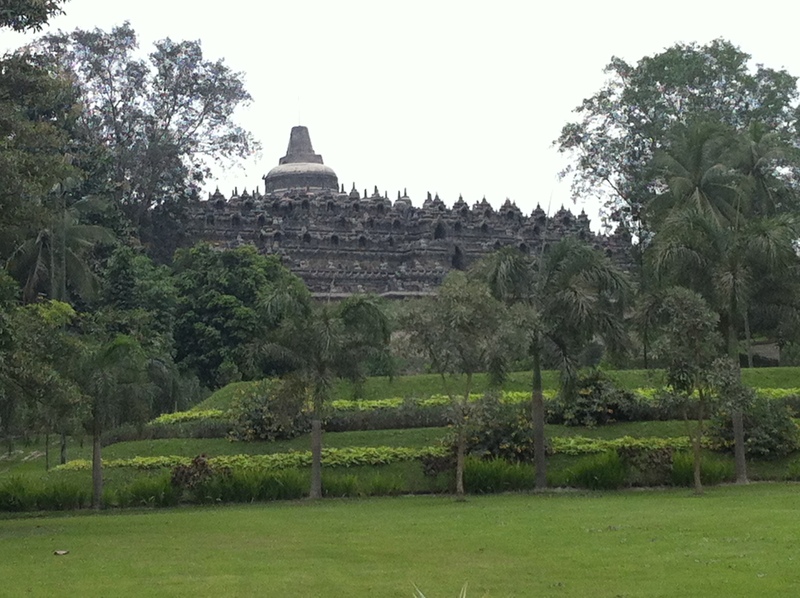 So on the first day, we walked down to Borobudur to check out the situation. Not brilliant. It would be a long time before the temple itself would be reopened, we were informed, although the grounds might be re-opened in a few days. 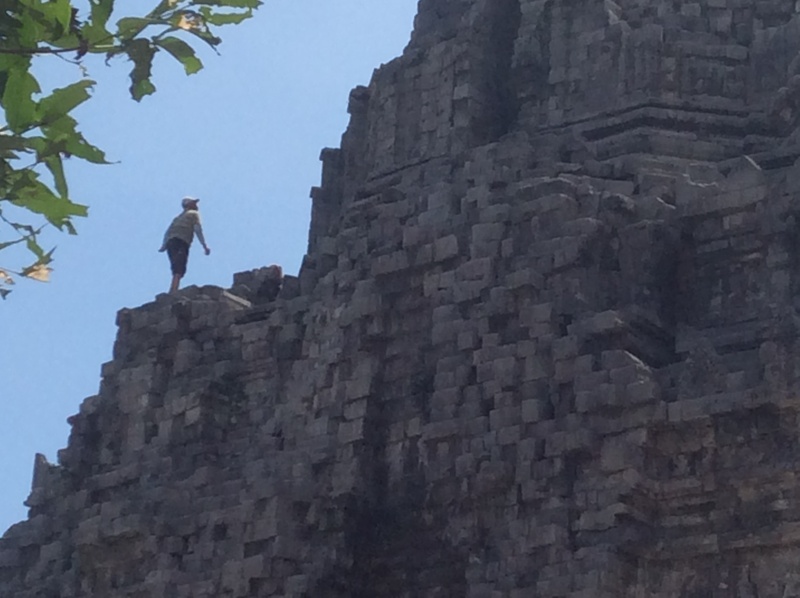 The locals helpfully guided us to a spot on a side road from which one could see the temple quite well. 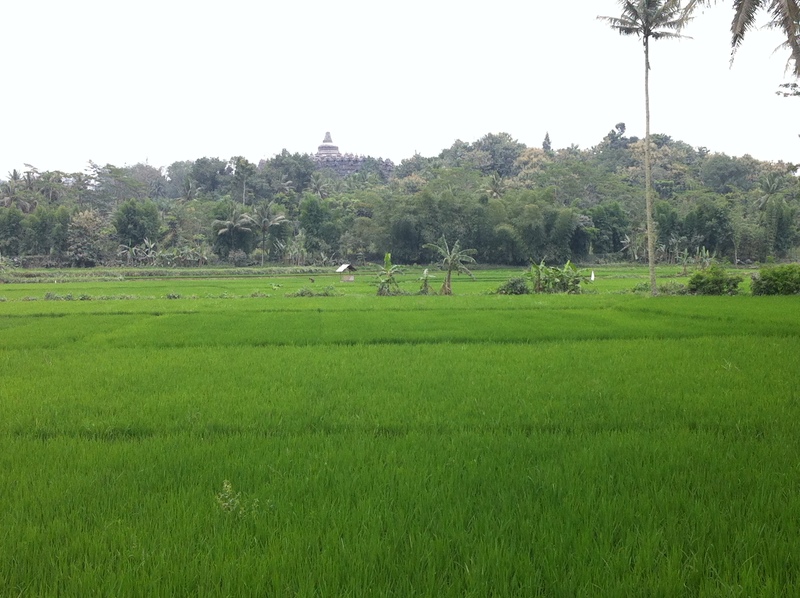 They were right, with the foreground of tender green rice shoots being particularly appealing. 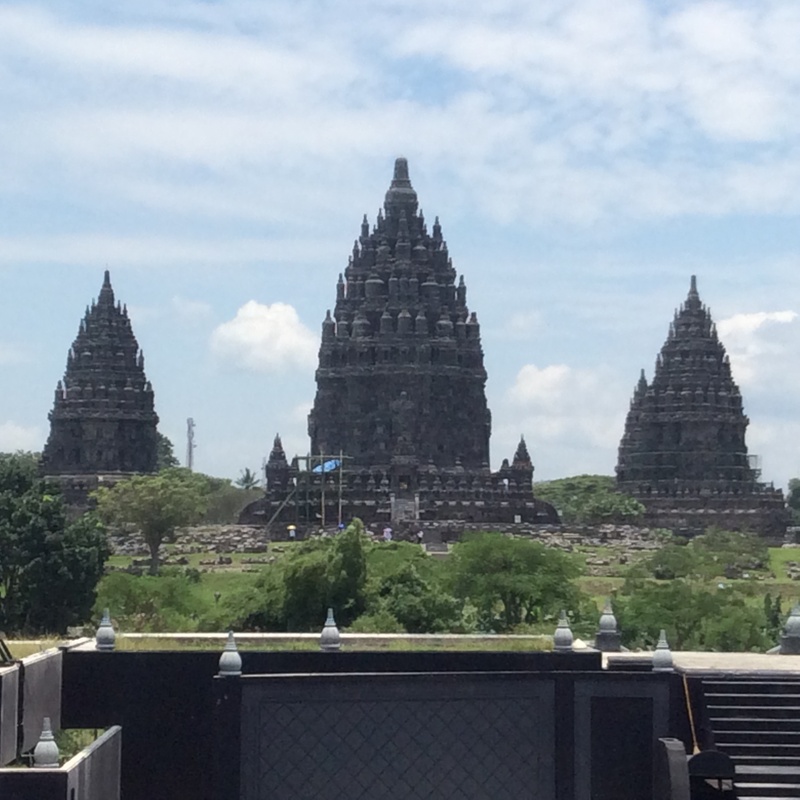 We then decided to go to a hotel abutting the temple grounds to have a late lunch, and discovered to our astonishment an excellent view of the temple from the back of the hotel. So, sitting on some steps I read out to my wife a description of all the things we were missing: the 2,760 bas-reliefs, “exquisite, considered to be the most elegant and graceful in the ancient Buddhist world”, as well as the 461 Buddha statues circling the middle and upper levels of the temple. Rather masochistic reading, I grant you, but I wasn’t having me carry that heavy guidebook all the way to Indonesia for nothing. And anyway, we kept telling each other, we might get closer still when they opened the park later in the week. 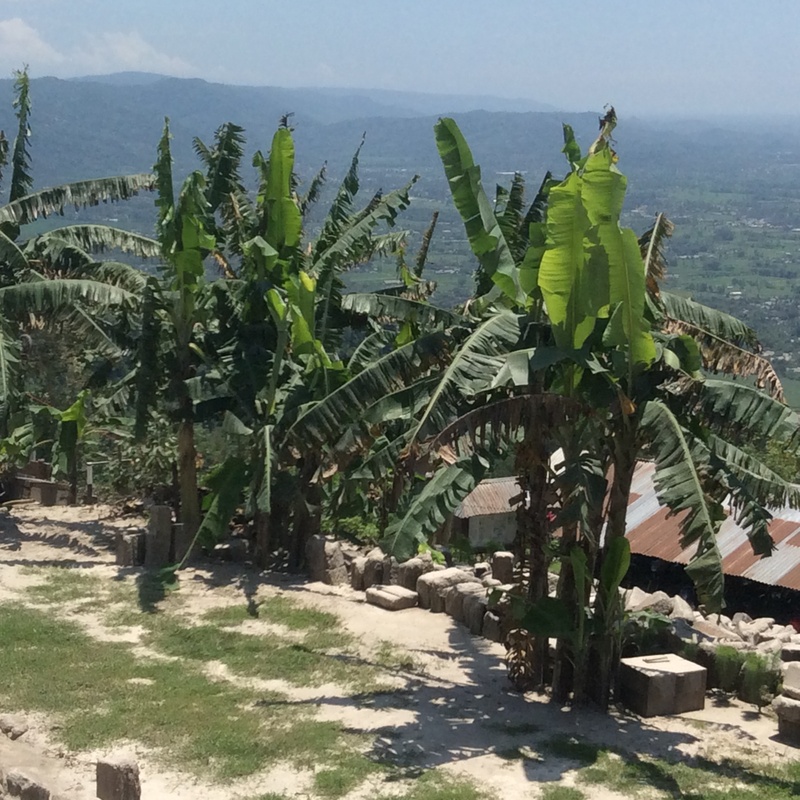 The next day, a local guide took us up to Dieng Plateau, which was a very pleasant drive up to 2,100m. 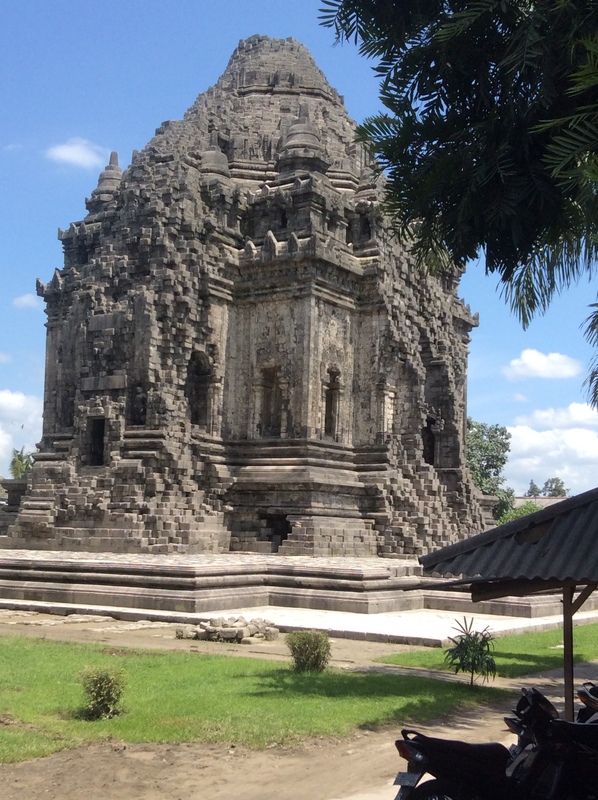 After visiting a smoking solfatara (the plateau is an ancient volcanic caldera complex) and a volcanic lake, we visited a series of small Hindu temples, “the oldest known standing stone structures in Java”, so the guidebook informed us. Here, Mt. Kelud’s ash had not reached, so we could visit them no problem. Intriguing. Each temple was rather small, with very dark interiors. It wasn’t clear to us why anyone would expend all that effort and stone for such a small inner space. We had to be missing something, and the heavy guidebook did not enlighten us. The next day, hope as I say springing eternal, we again walked down to Borobdur, to check if the park was open (yes) and if we could get any closer to the temple (no). 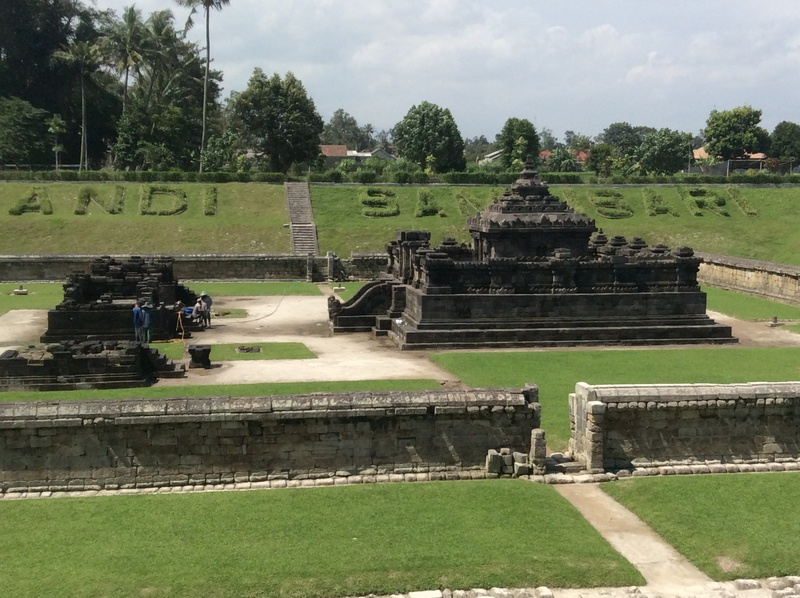 Giving up on Borobudur, we went to visit Yogyakarta for the day (where we had the delicious fried chicken I have previously mentioned). 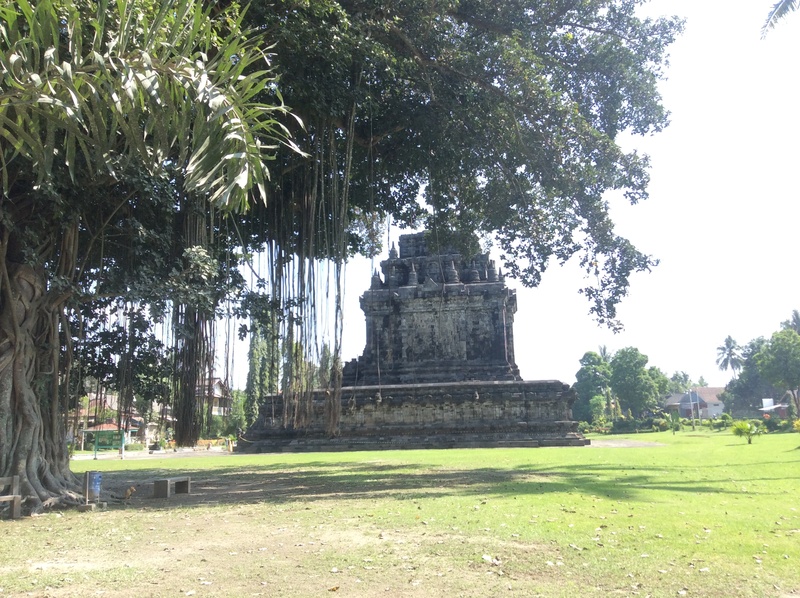 We now put our faith in our local guide, who said that he might, just might, get us into Prambanan. He also said we should have no problem visiting the smaller temples in the surroundings; the guards there were more relaxed. 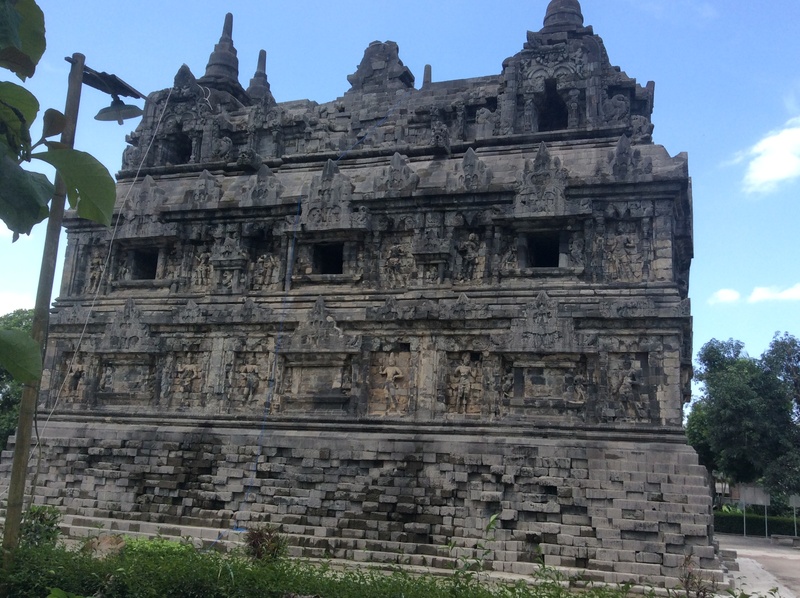 So, with hope springing etc., we set out the next day to visit Prambanan and a series of smaller temples. Alas, our guide was too optimistic. 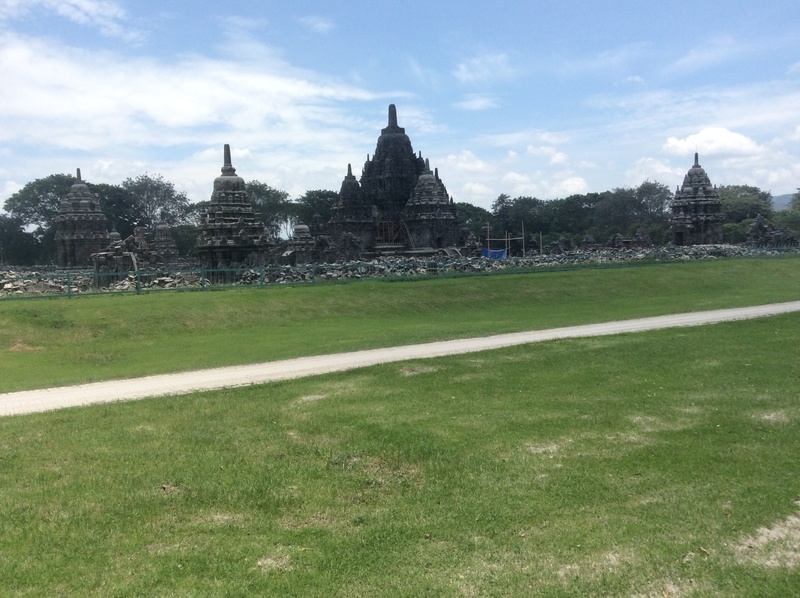 At Prambanan, we could go into the grounds but couldn’t get close at all to the main temples, so we decided to forget it. And as for the other temples, the universal answer was no, we couldn’t enter, the boss might come and it wasn’t worth their while risking it (after hearing this for the fourth time, we started asking ourselves who was this boss who seemed omni-present and ever so fierce?). 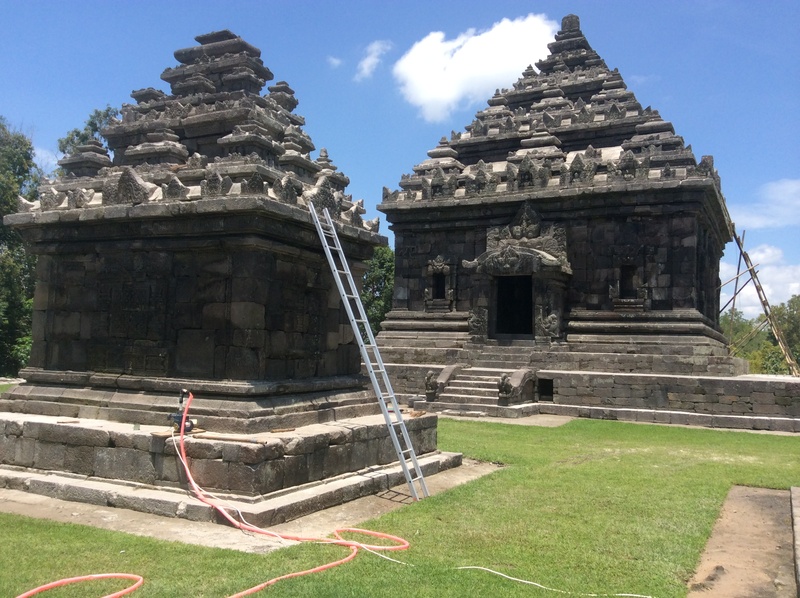 We contented ourselves with looking at the temples from the fences, except in the case of Prambanan where we sneaked through an open unguarded gate around the back and were rewarded with a great view of the temple ensemble. 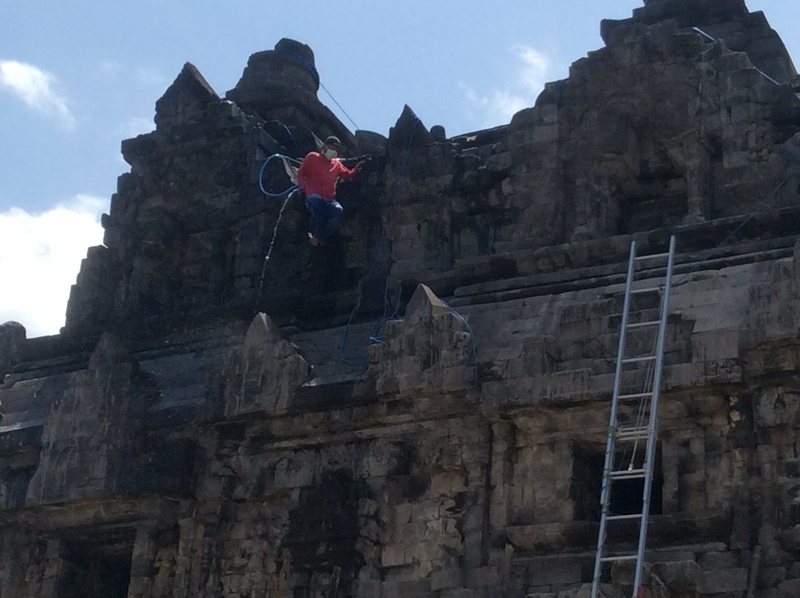 being cleaned by crazy cleaners – no safety harness, no ropes, nothing! 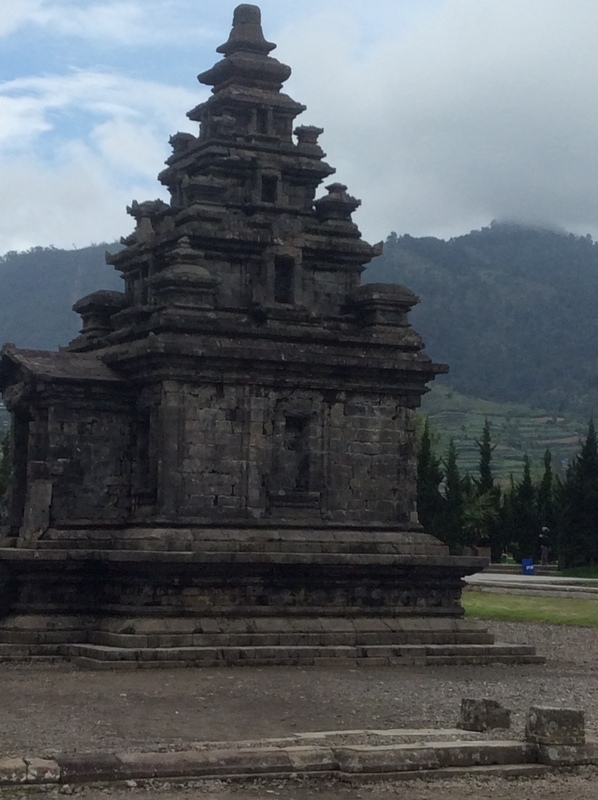 an odd temple, this one, seemingly sunken 5m below ground level but actually completely buried long ago during a volcanic eruption. This must have been a Pompeii-like event.